What Exactly is Vipassana Meditation? Headaches may range from minor inconveniences to debilitating pain. Although most headaches can pass quickly once the immediate need of the body is addressed, other types of headaches, especially migraines, may be chronic and more challenging to live with. Studies have shown that those who suffer from chronic headaches are more likely to report relief or their pain never returning again when they start practicing yoga regularly. Fortunately, yoga is one of the best practices to relieve and even cure headaches. A regular yoga practice, along with a few lifestyle adjustments can do wonders for your headaches overall well-being. Headaches are triggered by an imbalance in the body such as overheating (like from staying under the sun too long), dehydration, poor nutrition, pollutants in the environment, overuse of medication (even over the counter or doctor prescribed medication) and even poor eyesight and conditions like astigmatism. Stress from work and certain things you do in your daily life may also bring on a headache that can last for a few minutes to several hours or days. 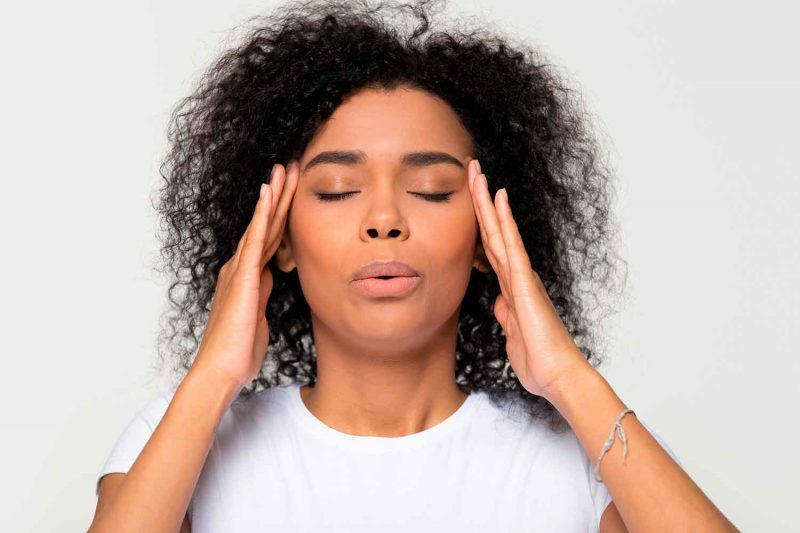 The pain of a tension or sinus headache can often be similar to that of a migraine and, unfortunately, are often misdiagnosed for each other which can lead to ineffective treatments. Unlike typical headaches, which can also be severe, migraines may be preceded by neurological changes such as numbness in some lumbs, vision changes, or difficulty speaking. Migraine pain also has a more throbbing feeling while other headaches have a pain often described as pressure. Sensitivity to light, sounds, scents, physical activity, and nausea leading to vomiting have been associated with migraines and not other types of headaches. 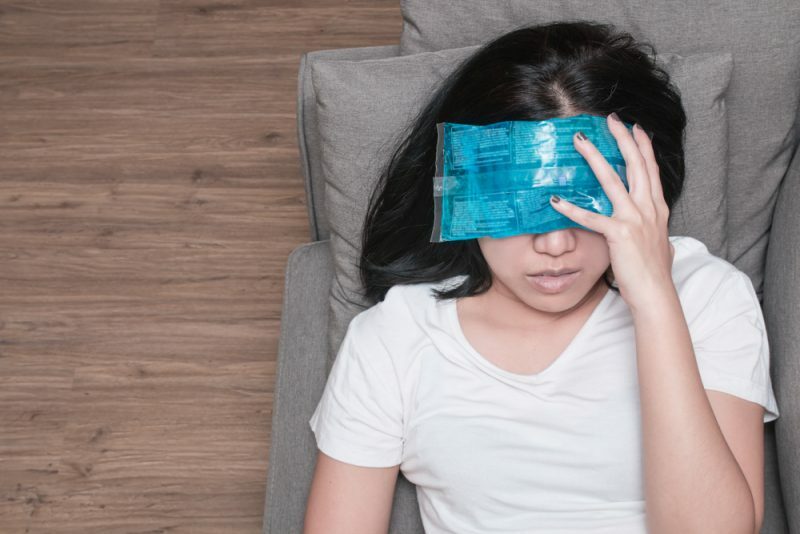 It is important to differentiate between a true migraine and other forms of headaches to seek proper treatment and not inadvertently make the condition worse. A lifestyle that includes regular, moderate movement, balanced nutrition, and a positive outlook can prevent many kinds of imbalances that lead to chronic pain and disease. 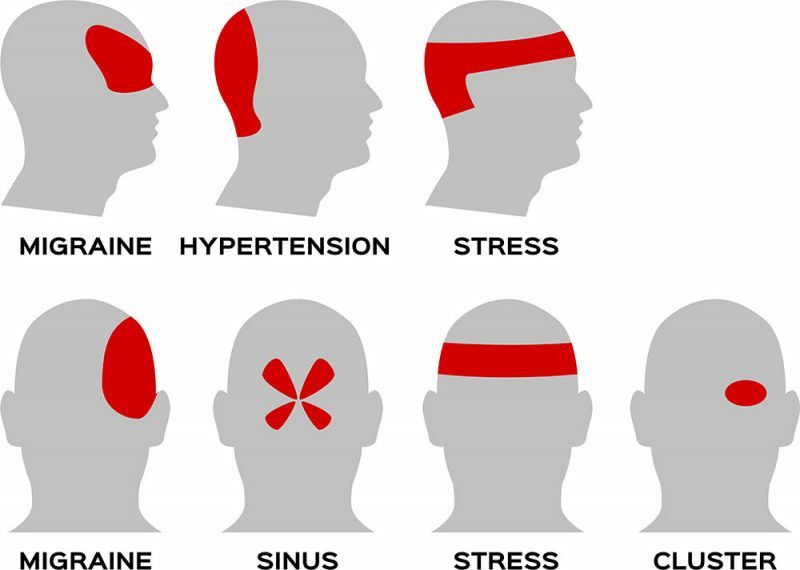 Most kinds of tension headaches are also accompanied by neck and scalp pain. Though there may be many contributing factors that cause headaches, some general tips may help keep them at bay. Stay away from heat, especially if it makes you sweat and get dehydrated. Reduce stress at work and at home. Reduce screen time on both your phone and computer and use a blue light filter or lens when you must be on your screens for long hours. Sleep at regular times with enough hours to go through several cycles of REM (Rapid Eye Movement) and Deep Sleep. Avoid overuse of medication which can also lead to chronic headaches. Many people treat their headache pain with over-the-counter medication. But before popping a pill, it’s worth it to try some simple yoga poses to help relieve headaches and even prevent them from repeatedly happening. A gentle Hatha style yoga practice has been shown to be the most beneficial to those with chronic headaches. Approach all the suggested yogasana (yoga poses) with mindfulness and focusing more on long, deep breaths. Move carefully, gently, and slowly when transitioning between each pose and even try to close your eyes as you practice to keep your practice internal and lessen the amount of headache-triggering stimuli that may distract you. 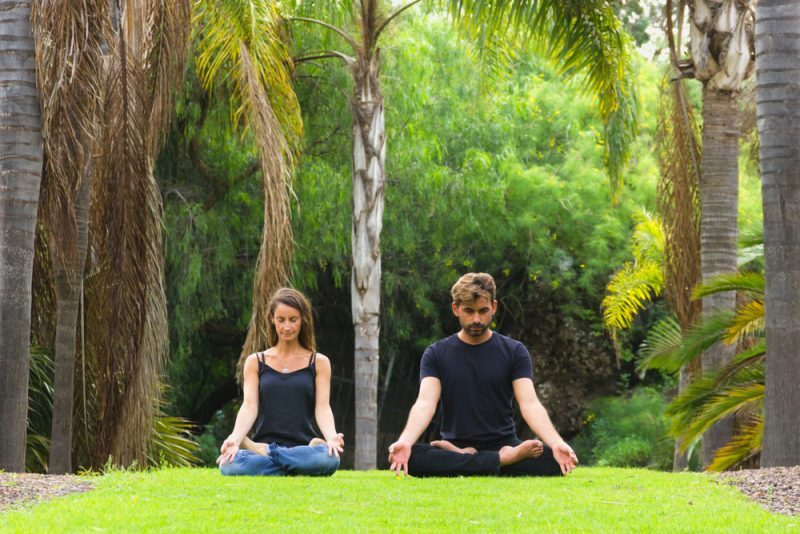 If keeping your eyes closed is too challenging at first, pick a spot in front of you as your drishti or focal point. Keep your gaze softly on this spot. Blink normally and do not strain your eyes or tense up your brows or facial muscles. Keep a small smile on your face while you practice to remind yourself to approach the poses with joy and mindfulness to heal yourself and not perform any feat or strength or flexibility. Yoga inversions are any pose where the head is situated below the heart. These include any variation of Sirsasana (Headstand), Sarvangasana (Shoulder Stands), (Adho Mukha Vrksasana) Handstands, Pincha Mayurasana (Forearm Balance), and other arm-balancing inversions. But asana which don’t require balancing with your feet off the ground are also considered inversions. Poses like Adho Mukha Svanasana (Downward Facing Dog), Uttanasana (Forward Fold), Prasarita Uttanasana (Wide Legged Forward Fold), Sasangasana (Rabbit Pose), and others also put your head in a position below the heart to help increase circulation and blood flow and relieve headaches. Take note that if you are suffering from a migraine as opposed to a tension headache, increased blood flow to the head may make the pain even worse. In this case, Balasana (Child’s Pose) may be the most beneficial yoga pose for you to stay in to stay completely relaxed with reduced external triggers to help the throbbing pain of the migraine subside. The Yin Yoga version of Balasana is recommended for headaches. From an kneeling position, sit on your heels and keep your big toes together as you separate your knees almost as wide as your mat. Walk your fingertips forward to bring your chest in the direction of the floor. If your sit bones begin to lose contact with your heels, stop folding forward. Close your eyes, relax your arms, and stay in Child’s Pose for three minutes or until you feel relief. If necessary, place a bolster or stack of pillows and rolled up blankets to prop up your torso at a comfortable height. Poor eyesight, wearing the wrong corrective glasses, and astigmatism can also lead to headaches. Eye exercises have been part of traditional yoga texts and are simple to add to your yoga practice. The easiest way to incorporate eye exercises for headaches is in Sukhasana (Easy Seated Pose) or in a kneeling position. Hold your right index finger up about six inches to a foot in front of your nose. (Some schools also instruct to hold up your thumb an arm’s distance away — either position will work) Cover your left eye with your left hand and keep both eyes open. Focus your vision on an object or spot far away in front of you for about 10 counts. Then shift your focus onto your finger for 10 counts. Do this for three sets then decrease the time to five counts for another three sets. Then rapidly switch focus between your finger and your chosen far away spot for about five counts for just one set. Close your eyes and rest and then switch to holding your left index finger up in front of you and covering your right eye with your right palm. Once you’ve finished with both eyes, relax your arms and squeeze your eyes closed tightly for a few seconds, and open them with a soft gaze and relaxed face. This is said to promote deep relaxation in the eye muscles. Repeat this three times and gently blink your eyes several times. Finish up your yogic eye exercise by briskly rubbing your palms together to warm them up and charge them with energy. Cover your eyes with your cupped palms and allow your fingers to cross each other at the space between your brows and forehead. This area is said to be the energetic point of the Ajna Chakra, or Third Eye Chakra, which balances internal sight, intuition, and the mind. Even the traditional Lotus flower which represents the Ajna Chakra has only two petals to symbolize the left and right hemispheres of the brain. Stay with your palms cupped over your eyes for a minimum of 30 seconds. Nothing beats sitting or kneeling in silent, closed eye meditation to treat headaches and many other ailments. Savasana (Corpse Pose) is also an excellent yoga pose for meditation and headache relief. Focusing on deep breathing puts the body into rest, digest, and repair mode and alleviates tension and stress associated with most types of headaches and migraines. Meditation in itself can be a challenge to start but, just like a yoga asana practice, it takes time and setting aside a regular space for it once or twice daily before it becomes routine. Even if you’re only able to meditate for one to three minutes at first, you’re already laying a good foundation for your practice. And make your meditation time a joyful one. No need to beat yourself up when random thoughts enter your mind. The point of meditation is not to stop the mind from thinking, but learning to not react to and get distracted by those thoughts that pop up. Schools like Transcendental Meditation advocate closed eye seated meditation for 20 minutes twice a day with an internal mantra. Your meditation practice will work just as well with or without a mantra. If you need a bit more guidance, apps like Headspace or free guided meditation videos on YouTube are helping hundreds of people around the world get into a meditation practice. Chronic headaches and migraines can seriously and negatively affect quality of life and well-being. Even though medication may be the quickest solution for the pain, a gentle yoga practice has been proven to have far more benefits for headache sufferers that go beyond relieving their pain.